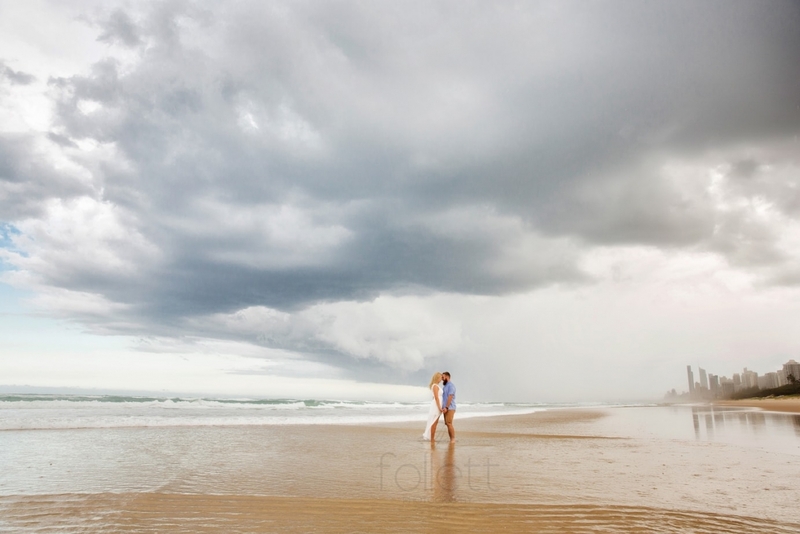 Do you like the idea of a Beach Engagement Shoot? Well, Emily and Tom did. Emily and Tom chose me as their wedding photographer after after remembering the story I captured for Jo and Joe’s wedding back in 2015. Emily loved her brothers wedding photographs, as well as the vibe on the day surrounding the photographs. What an honour I have to capture their wedding in September at the Novotel Twin Waters Resort. I will definitely blog about the wedding just after it, sharing all I find out about her dress, hair, makeup, and DIY details. But for today, lets just stare at these gorgeous images! Tom is very excited to have his beard featured, but Emily, not so much. We chose a quiet beach on the Gold Coast. There was a storm approaching, so we knew we only had a short window for photos. We hung around for one last shot, meaning we got completely drenched on leaving the beach. But lets face it, it is completely worth it! Follett Photography offer complimentary engagement sessions with every wedding package booked. It is the perfect way to get to know each other better, and for the groom to see that the photos are not going to be the worst part of the day!! (True, some grooms need more convincing then others) It is a good idea for everyone to get an engagement shoot. If you are unsure as to reasons why to take engagement photographs, and these photos do not convince you, check out this article found on The Knot website.